Your question couldn't have come at a better time. With the holidays fast approaching, a new pair of red hot heels might be the only thing you need to dress up. 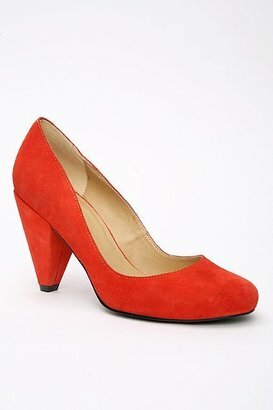 I've been eying these BDG Suede Pumps (above, $48, urbanoutfitters.com); the brilliant hue says party time, while the rounded toe and low-yet-flirty heels suggest these beauties would be comfortable enough to wear for hours. For more affordable options, check out my red-shoe selections using the widget below. Love the UO ones! Too cute! Love em!! How can you possibly be in anything less than an excellent mood while wearing those? I have red heels but they are very summery. You have picked some cute cold weather options!